Stephen W. Freiman, John J. Mecholsky Jr. 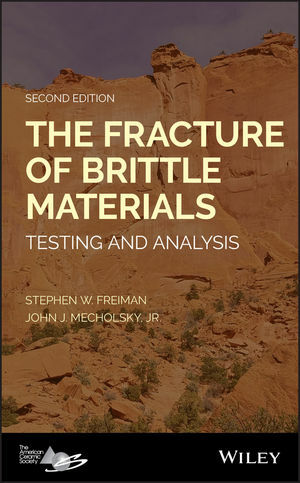 This book examines the testing and analysis of the fracture of brittle materials. Expanding on the measurement and analysis methodology contained in the first edition, it covers the relevant measurements (toughness and strength), material types, fracture mechanics, measurement techniques, reliability and lifetime predictions, microstructural considerations, and material/test selection processes appropriate for the analysis of the fracture behavior of brittle materials. The Fracture of Brittle Materials: Testing and Analysis, Second Edition summarizes the concepts behind the selection of a test procedure for fracture toughness and strength, and goes into detail on how the statistics of fracture can be used to assure reliability. It explains the importance of the role of microstructure in these determinations and emphasizes the use of fractographic analysis as an important tool in understanding why a part failed. The new edition includes a significant quantity of material related to the fracture of biomaterials, and features two new chapters—one on thermal shock, the other on the modeling of the fracture process. It also expands on a discussion of how to treat the statistics of fracture strength data to ensure reliability. The Fracture of Brittle Materials: Testing and Analysis, Second Edition is an important resource for all students, technicians, engineers, scientists, and researchers involved in the study, analysis, creation, or testing of ceramics.